While no one loves being woken up before 5am by a hungry baby, there is something special about watching the sunrise. Still half asleep yesterday morning I sat up in bed, son in my arms, staring out of the window as the sky slowly paled from ink to clear blue, and pink cloud-studded streaks blossomed on the horizon. By the time I lay back down again the sun was the palest yellow, a soft egg yolk hanging low in the sky. Yesterday was the first day in Brisbane that really felt like autumn had come to play. The evening was breezy and the air fresh rather than heavy with heat. After dinner it was cool enough for a cuppa before bed, and during the night we dragged the doona over ourselves. This morning as I pottered around the kitchen barefoot making tea, I found myself shivering for the briefest of moments. After months and months of crazy humidity and high heat, autumn is most welcome. When I lived in Melbourne, autumn was hands down my favourite season. Sure, I love the Melbourne spring when the jasmine blooms and the blue-stoned laneways are heavy with their perfume. And summer evenings spent in various beer gardens with good friends and cold beverages. But autumn in Melbourne is something special – purple twilights that stretch out for hours, footpaths crunchy with golden leaves, warm afternoon sun on bare shoulders and cold evenings with scarves and red wine. The perfect temperature for bike riding, and love making. 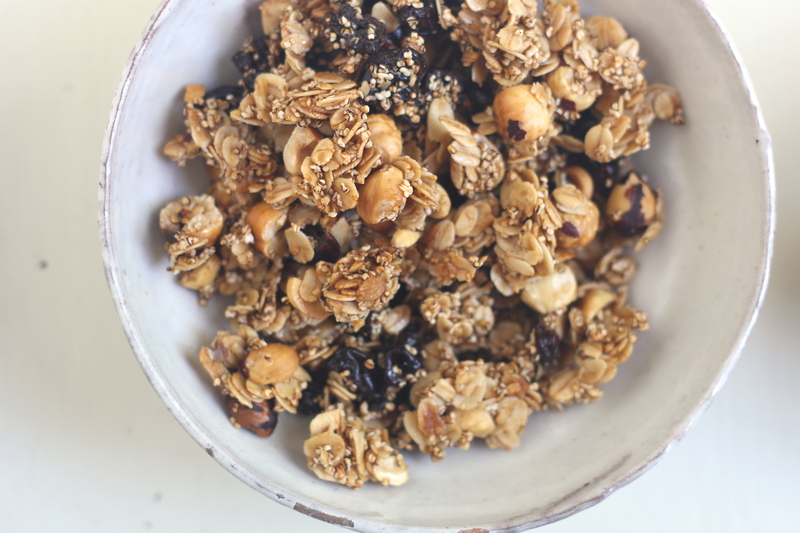 The flavours in this granola are like autumn in a bowl. 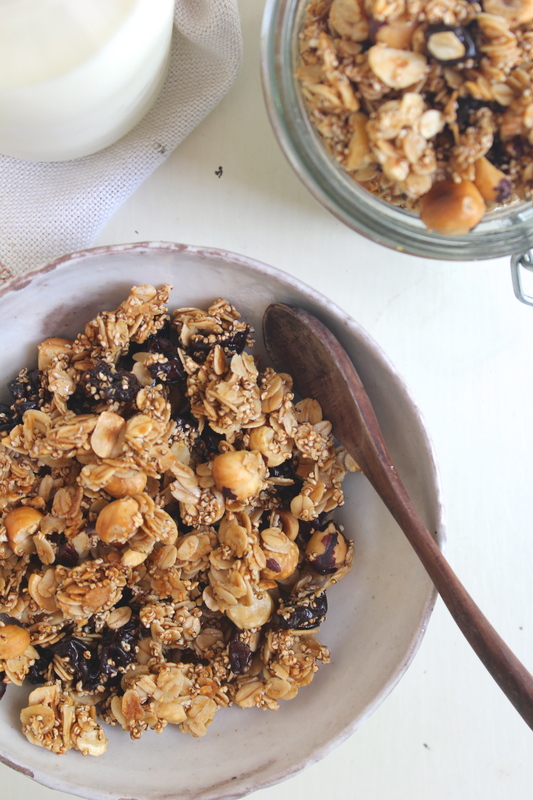 Dried cherries and roasted hazelnuts bring a wonderful depth, the maple syrup adds just a hint of decadence, and the oats and amaranth bring some of that whole grain goodness. I feel like this is more of a special-occasion than an everyday breakfast. 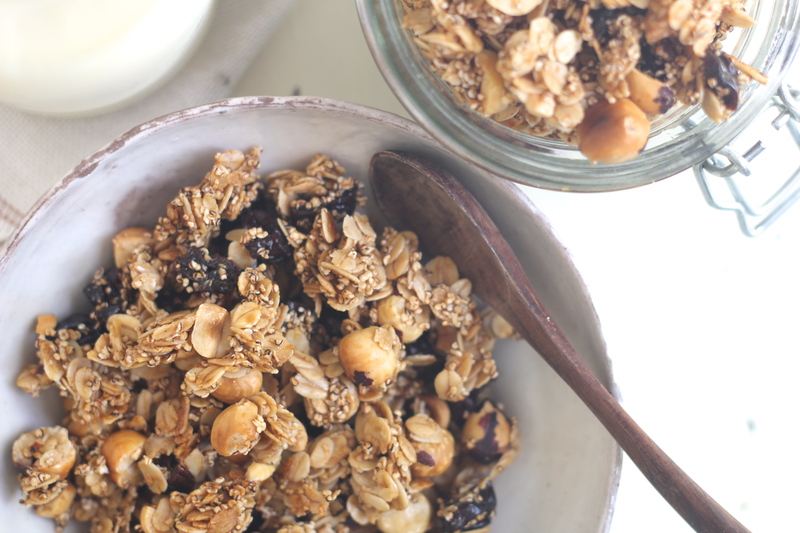 With a splash of milk, a scoop of thick greek yoghurt, and perhaps a handful of blueberries – delicious. Preheat oven to 200° celsius/400° fahrenheit. 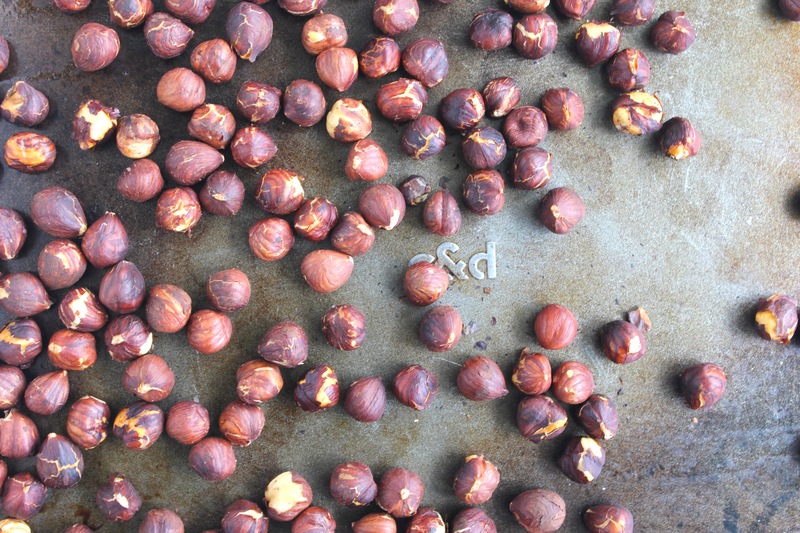 Spread the hazelnuts over a single layer on a tray and bake for 10 – 15 minutes, until they are golden and aromatic. Remove from the oven and set aside until cool enough to handle, then remove the skins by rubbing the nuts between your fingers. Roughly chop. Turn oven down to 150° celsius/300° fahrenheit. Line a large baking tray with baking paper and a drizzle of coconut oil. Dry toast the amaranth in a pot over a high heat, with the lid on. Keep a close eye on the pot and give it a shake every 10 or 15 seconds for approx. 3 minutes (you’ll see the amaranth pop, much like popcorn does). Remove from heat and set aside. Roughly chop the dried cherries. 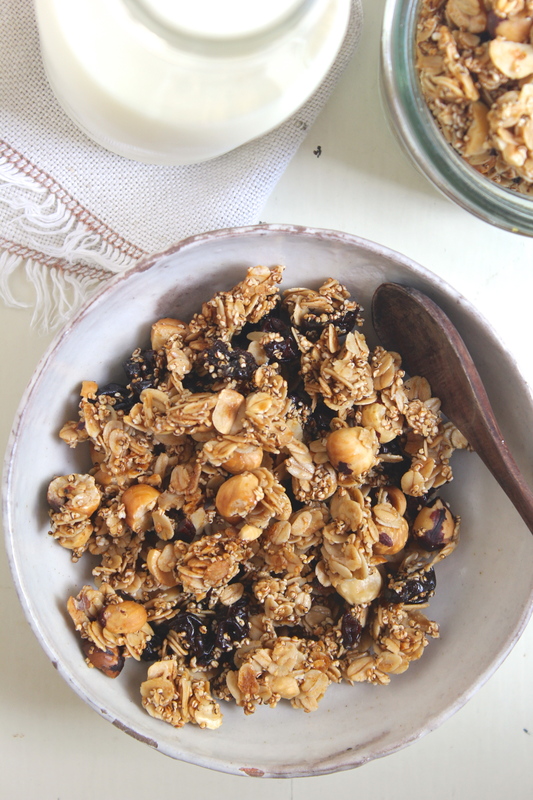 In a large bowl combine the rolled oats, toasted amaranth, chopped hazelnuts, and chopped cherries. In a small saucepan combine the coconut oil, maple syrup, sugar and vanilla bean paste, heating over a medium heat until melted together and warmed through. Add the pinch of salt and stir. Notes: if you don’t have any vanilla bean paste handy, replace with a teaspoon of vanilla essence. 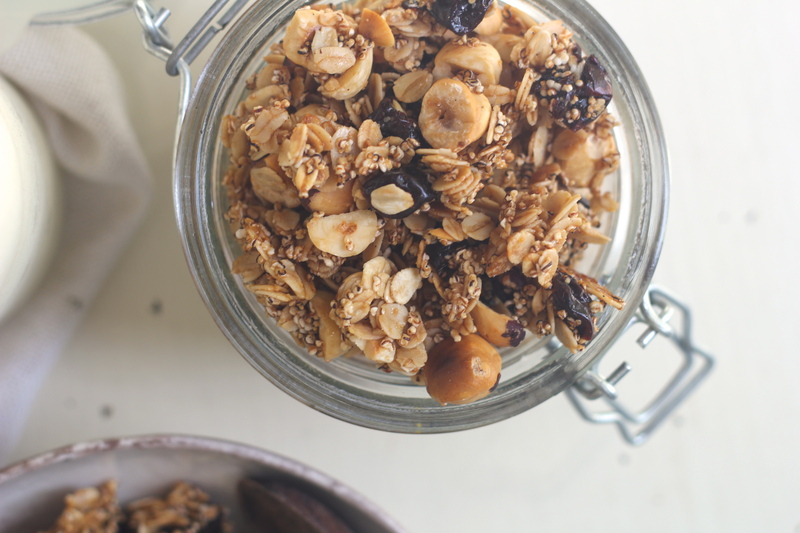 Likewise, the coconut sugar can be replaced with regular brown sugar and if you’re not worried about keeping the granola vegan, the maple syrup can be replaced with honey. 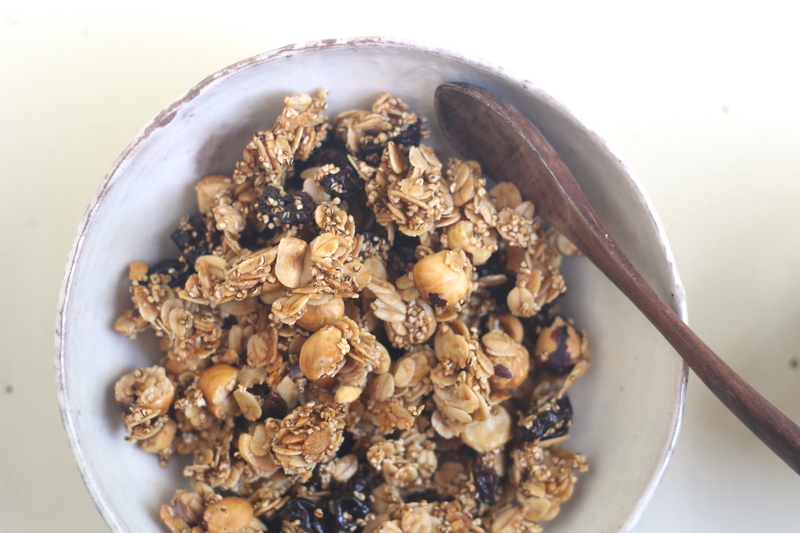 This was actually the first time I used amaranth in granola – so good! It’s both a beautiful time, but also a sleep interrupter. Much like small children!